I hate bugs, which include fleas, ticks, gnats, and anything else that has creepy legs or flies around. Sorry, I can’t pretend that I care for them. I don’t want to go out and use pesticide and kill them; I just don’t want them hanging on me and certainly do not want them hanging on Dexter. I fully believe in natural pet care products and try to review various products to find out what works and what doesn’t. 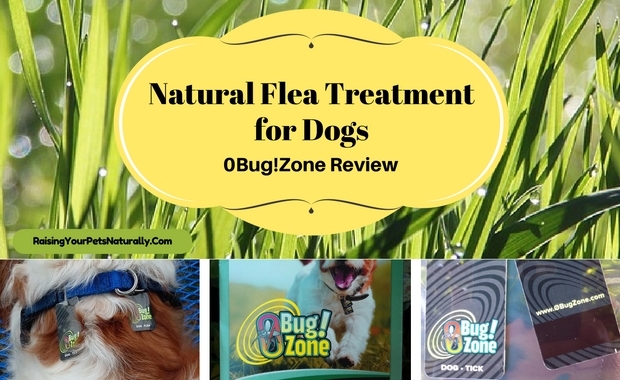 The folks at Pet Wellbeing asked me to try their natural flea and tick solution, 0Bug!Zone for dogs. 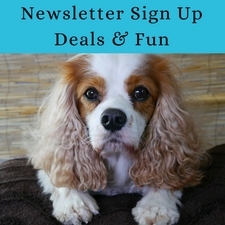 True to form, I took a look at their natural flea and tick product online first. 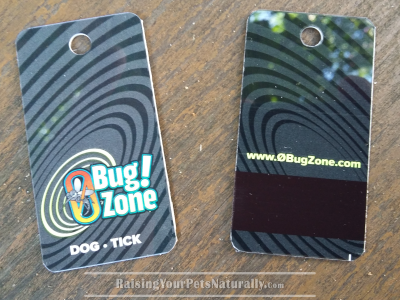 0Bug!Zone for dogs is a very interesting natural bug repellent. It is not like your typical natural bug spray; it works on a completely different level. It uses electromagnetic frequencies to create a chemical-free insect barrier from pests. The concept is very intriguing. However, because Dexter has a neurological condition, I did want to talk to one of his holistic veterinarians, Dr. Mary, to ensure it would not affect Dexter in any negative capacity. She gave the product a green light, so I proceeded to give 0Bug!Zone a try. When the 0Bug!Zone arrived, I carefully read the instructions. The instructions say to attach the tags (one flea and one tick) to a dog’s collar with the magnetic strip facing the dog’s body. 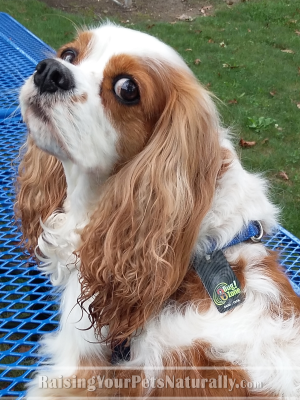 The website provides a variety of ways to attach the tags to a dog’s collar to ensure both magnetic strips are facing the dog, including using a ring or zip ties. I’m unclear on why there are two different tags for ticks and for fleas; I can only assume that each tag has a different electromagnetic frequency. The instructions go on to say that the 0Bug!Zone must be worn at all times and that the barrier of protection starts about 24-36 hours after attached. Well, this poses some problems for Dexter. Because of Dexter’s neurological condition, he cannot wear a collar. He wears a harness for walking, but I cannot leave that on at all times because it does aggravate his condition. Therefore, I had to improvise, and attached the tags to the harness he only wears during walks. The instructions also say that it is applicable for people too, but I’m not sure someone would wear both tags 24/7. 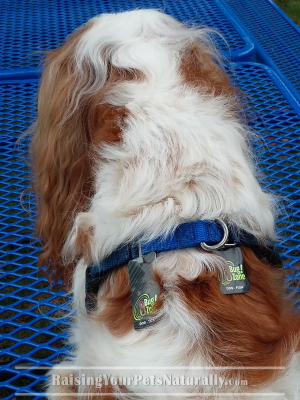 For the last couple of weeks, Dexter has worn the 0Bug!Zone tags when he goes outside. 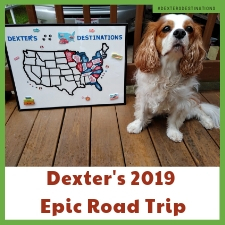 I have to say I have not seen any bugs, fleas, ticks or other pests on or around Dexter. However, it is a rarity to ever find any on him. Here in Ohio, we are just outside our prime pest time of the year, so I think it’s a little hard to tell if it’s the product or that there aren’t any around. I haven’t seen any flying pests on our walks to the park, woods or otherwise. 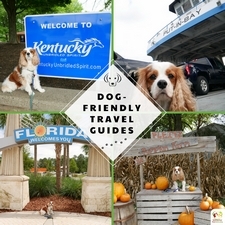 Is your dog an outdoorsy kind of dog? Tell me in the comments. I will be interested in hearing the results of this next year in the spring/summer when the bugs are in full force. Please let me know! Sure thing! He still has them on and we still have not had any ticks/fleas. Now that is an interesting and different take. Will keep it in mind for next bug season! Glad that you’re not seeing the pests. A number of these types of products have been around for many years (“ultrasonic” flea shoo-ers, etc) and I must say I’m a skeptic. Would love to have something nontoxic AND effective from the natural realm. And I’d like to see the science and studies supporting this product’s effectiveness (what I look for in everything for my pets *s*). Thanks for sharing the info! Sure thing. They may have some science/studies out there. I will say, we’ve been using a natural approach to flea/tick for years and have been pest free. So, no need for chemicals for us. Very interesting concept. I will look more into this. Thank you for the review! Sure! We are willing to look at all natural alternatives for being pest free. I concur: I don’t like putting chemical-based products on my dogs either. My dogs are outdoorsy (when we are at work they stay in our back yard). Thankfully, where we live in Orange County, we haven’t had a problem with fleas or ticks (knock on wood). Awesome. We have been using natural remedies for a few years with great success. Like you, I’m interested in natural products when possible, so this sounds promising. My dog Jack seems to be immune to any flea medication, and that includes homemade and other natural treatments I’ve tried. The only thing that has worked so far is the soresto collar, so I’d be curious to see if this would protect Jack. That’s too bad some of the natural ones didn’t work. We’ve been naturally pest-free for years. There are different oils for different bugs. I would make sure you are targeting the right bug/oil. Good luck. It’s pretty cool. Please feel free to let me know how it works for Gremlin. I’m convinced Mr. N is a bug magnet. We’ve tried various natural remedies but he really needs the chemicals. He has a flea allergy and even one half-dead flea drives him bananas. Keep us updated on how this works during flea season! Sure thing. I am too. If you ever want to PM me, I’d be happy to share somethings that work for me. This is an intriguing concept, I look forward to learning how it works when fleas are in full force. Thanks, Beth. Me too. Now, I am starting to see bugs and still no fleas/ticks or anything buzzing Dex. Very interesting. I hate bugs and tend to go with topical and spray but always interested to hear about great natural alternatives. Look forward to hearing how this works in spring/summer. We’ve been chemical -free for fleas/ticks for years. Hoping this is another alternative for folks. Well this is an interesting product for sure! I had never heard of this one! Glad to bring it up. Check it out. 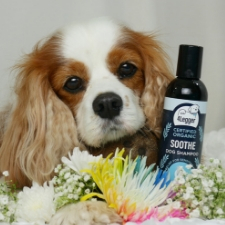 Natural is the besy way to go, remembering to be conscious of the natural oils and substances that are pet safe. I read that some natural ones like Rosemary might not be, I had no idea! Yes. All products need to be used correctly. Oils need special care because of the concentration. Rosemary can elicit seizures with pets/people who are susceptible. We stay away from that for Dexter because of his neurological condition. So your dog only needs to wear them when they go outside? Because my dogs don’t usually wear a collar inside the house. This is a very convenient solution!! 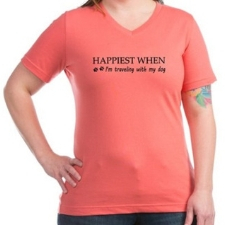 They are supposed to wear 24/7 but we do not. So far, it seems to be working. Sure. Please let me know. I love to hear more feedback on products. What an interesting concept for flea control if you want something natural.